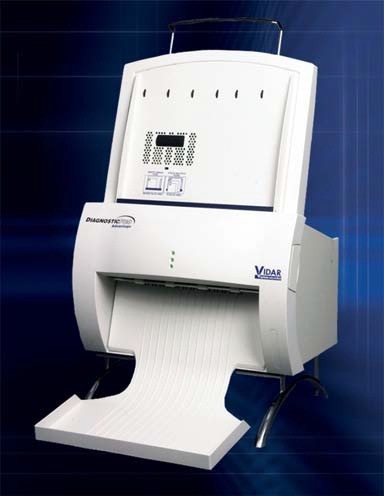 VIDAR's DosimetryPRO® Advantage (Red) offers the radiation therapy market a specifically developed digitizer that meets the specific needs for those using popular standard film such as Carestream's Kodak EDR2 and film chemistry, as well as for those who use International Specialty Products' GAFCHROMIC EBT Film. 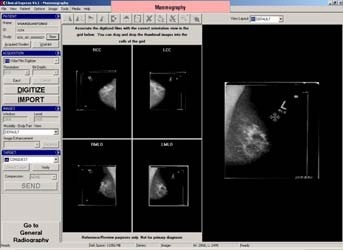 DICOM MG standard to identify the specific mammography view contained on each film. See VIDAR’s Whitepaper “Realizing the Benefits of Full-Field Digital Mammography; The Role of the Film Digitizer” for more information. In order to read a new mammography study, radiologists and mammographers may require the two most recent prior studies. The ongoing transition to digital technology in mammography often requires radiologists to view both film-based priors and new digital images for the same returning patient read. 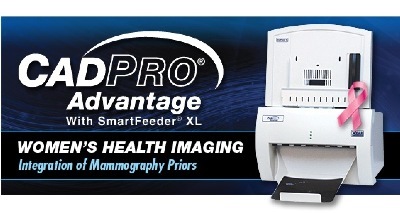 The CAD PRO Advantage is able to bridge the gap in the transition to digital mammography – allowing for the digitization of film-based prior studies so that adiologists can view these priors, with their specific hanging protocols, on the mammography reading workstation. Radiologists and mammographers have limited time for reading studies, and the need to move from digital workstation to light box and back is cumbersome and time-consuming – creating a less-than-ideal clinical and diagnostic nvironment. The award-winning SIERRA Advantage film digitizer allows for an affordable solution for teleradiology and low-volume digitizing. It overcomes some of the most common barriers to digitizer use — quality, cost, and size. It is the first film digitizer small enough to be easily wall-mounted, solving siting problems commonly found at hospitals and radiology offices. Featuring easy USB connectivity, an LED lighting system, and availability with a single or 10-sheet film feeder, the SIERRA Advantage allows you to increase report turn around time and reduce courier costs – all while utilizing the current PACS infrastructure. 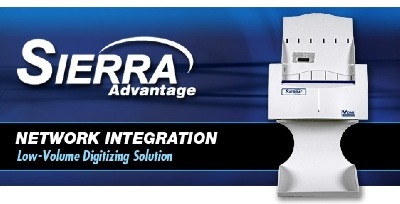 You can integrate outlying clinics for a fraction of the cost of low-end CR products. The RoHS compliant SIERRA Advantage features VIDAR's next-generation prorprietary High Definition CCD (HD-CCD®) technology, and its unique ADC (Automatic Digitizer Calibration) feature results in virtually no variation in image quality and ensures excellent grayscale reproduction in every image. Unlike other digitizers that require biannual calibration or cleaning, VIDAR digitizers need no maintenance or calibration, saving nearly $2,000 annually. The straight-line film path reduces the need for costly service calls ($500 or more each) due to film jams. Parts replacement, on-site service, shipping, and service costs for factory repairs can reach $4,500 annually for laser digitizers. An analysis of a three-year total cost of ownership demonstrates that the cost of owning a laser digitizer is significantly more than that of a SIERRA Advantage. Mammography – or combine the two. Add-on modules for Modality Worklist and/or Patient Data Interchange (PDI) are available to complete your solution. workstation.Digitize general radiography films or CT/MRI images. ClinicalExpress provides a dedicated user interface for digitizing mammography priors. 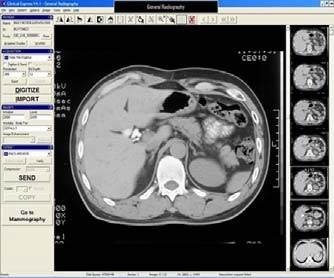 A visual display allows the user to quickly see if the films are in the proper order for application of DICOM MG hanging protocols. Radiologists see the prior images along with the new digital study on the mammography reading workstation with their hanging protocol preferences applied. Most importantly, radiologists can focus on their task with fewer interruptions and without moving between two different reading technologies (a soft read workstation and a film view box). This has a negative impact on the visual system as well as the radiologist’s concentration. information and minimizing the possibility of misplaced images. documents into the patient’s file, providing the convenience of one software control while protecting your digitizer investment from the dust and debris associated with paper. used for Reference/Review only, not primary diagnosis. ClinicalExpress is not diagnostic viewing software. and is therefore not appropriate for mammography.